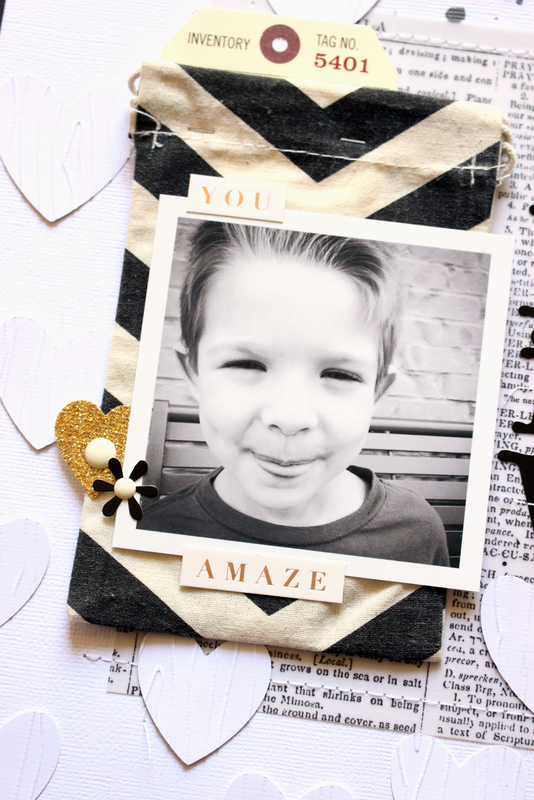 This week on the American Crafts Blog, the Design Team has been sharing projects using the DIY Shop 2 collection. I love that DIY Shop 2 includes great neutrals mixed with Gold and a ton of amazing embellishments. I thought it would be great to pair the collection with a Black & White photo of our son, and bring in touches of the Gold. How to: Cut white cardstock to 11.5x11.5" then adhere to the Gold Foil on Black paper. Splatter black spray mist on the background. Cut the Dictionary on Vellum paper to 7.5x7.5", place in the center of your page, and machine stitch with white thread. Layer your photo over the Chevron Muslin Bag and adhere the bag to the left side of your page. Place one of the Mercantile Tags inside the Muslin Bag. Use the Black Letter Stickers to create the title on your page and stitch your letters onto the page. 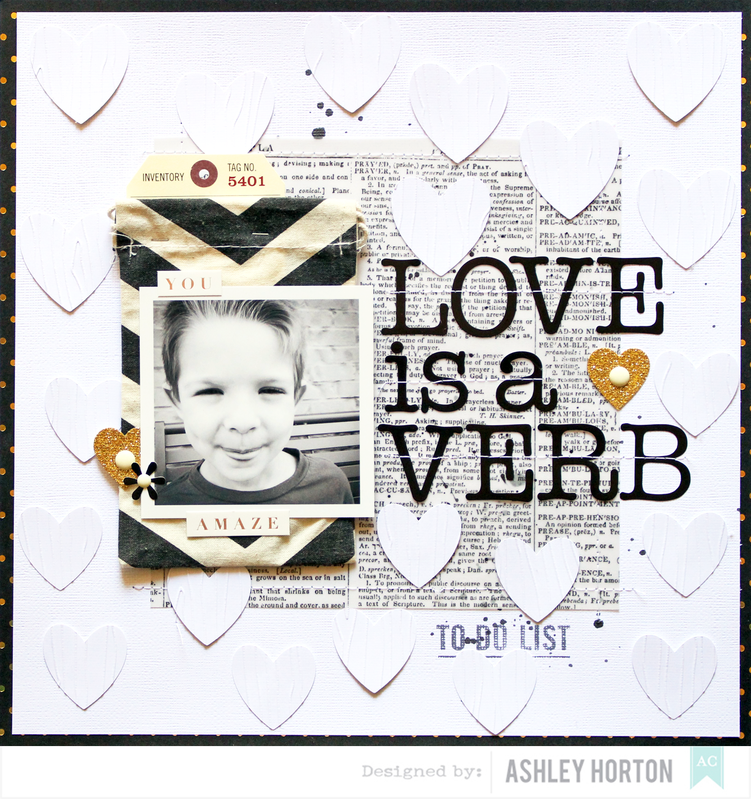 Use a die cut machine or punch to create heart shapes and place them in the Shimelle Embossing Folder. 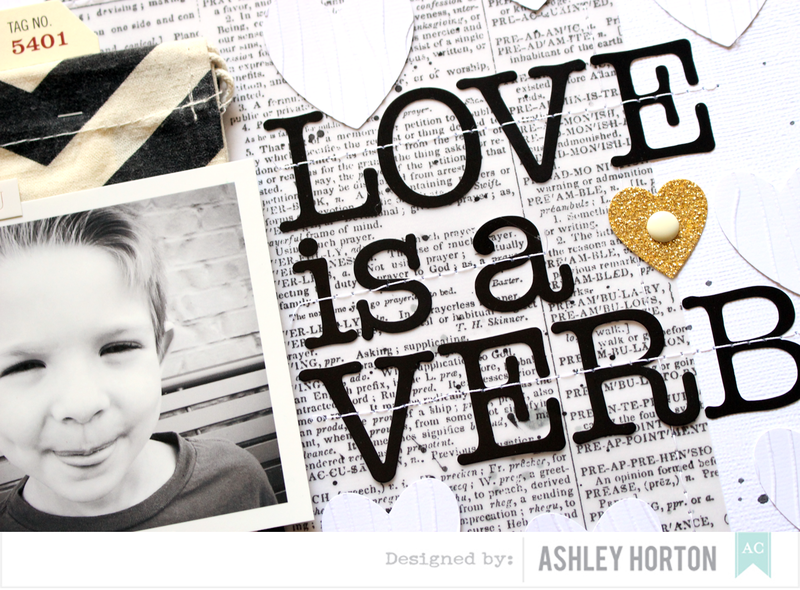 Once your heart shapes are embossed add them to your layout and finish embellishing with Gold Sticker Hearts, Enamel Dots, and Letter Stickers. Thanks for stopping in today, and I hope you have a great weekend! !